The Bundaberg business community has united to save nearly 12,000 lives in the past year, and have already set a goal to save even more in 2019. Bundaberg Blood Donor Centre Manager Dean Krueger commended Bundaberg’s most generous local business and community groups for joining together to build camaraderie and do something special for those in need. “Nearly 12,000 lives have been saved in the past year thanks to the 3820 donations given by some of our most generous local business and community groups,” he said. The Blood Service officially thanked these generous donors at a special event, where representatives from Friendly Society Private Hospital, Auswide Bank, Giving for Little Grayson, and Ken’s Kepnock Butchery. 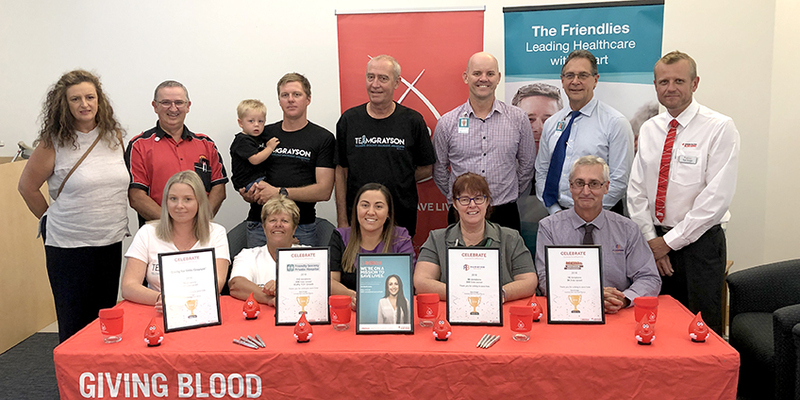 Mr Krueger said he hoped the efforts of these remarkably generous locals would inspire other local businesses and groups to join the Blood Service’s Red 25 program – a group donation where local businesses, community groups and universities see who can donate the most blood each year. “Last year, we had 3820 donations linked to Red 25, and in 2019 we want to achieve 5000 donations,” he said. The Friendlies Red 25 team was recognised for making 112 donations last year, with a 2019 goal of reaching 160 donations. “One in three people will need blood in their lifetime, chances are they could be your workmate, neighbour or family member. “Donating blood takes only one hour and is an easy way to help cancer patients, surgical and trauma patients, new mothers and babies, people with immune disorders and many others. “In addition to growing our Red25 program in Bundaberg, we also need 369 new donors over the coming months in Bundaberg to continue to patients’ needs,” he said. Any business or group can donate as part of Red25. Donations are tracked online, allowing groups to track how many lives they have saved. For details on Red 25, visit donateblood.com.au or call 13 14 95.